Trump said there would be "some very interesting items coming to the forefront over the next two weeks." 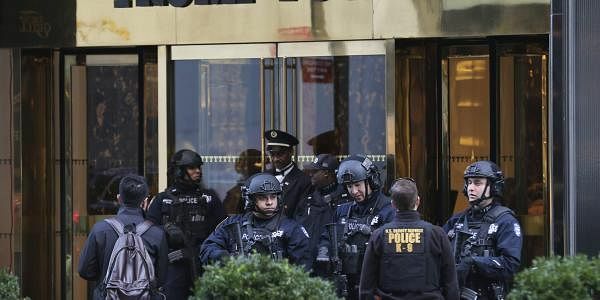 WASHINGTON: The White House on Thursday stood by President Donald Trump's unproven accusations that his predecessor wiretapped his New York skyscraper, despite growing bipartisan agreement that there's no evidence to back up the claim and mounting pressure to retract the statement. Angrily defending the president's statement, White House spokesman Sean Spicer told reporters Trump "stands by" the four tweets that sparked a firestorm that has threatened Trump's credibility with lawmakers. Spicer denounced reporters for taking the president's words too literally and suggested lawmakers were basing their assessments on incomplete information. Spicer's comments were a rebuttal to the top two members of the Senate intelligence committee, who released a statement earlier Thursday declaring there is no indication that Trump Tower was "the subject of surveillance" by the U.S. government before or after the 2016 election. Spicer suggested the statement from Sens. Richard Burr, R-N.C., and Mark Warner, D-Va., was made without a full review of the evidence or, incorrectly, a briefing from the Justice Department. "They are not findings," he said. The standoff between the White House and lawmakers came four days before FBI Director James Comey is slated to testify before Congress, when he will inevitably be asked whether the president's accusations are accurate. The White House's refusal to back down raised the stakes for Comey's appearance before the intelligence committee on Monday. Trump tweeted earlier this month that President Barack Obama "was tapping my phones in October" and compared the incident to "Nixon/Watergate" and "McCarthyism." Trump, in an interview Wednesday with Fox News, said he'd learned about the alleged wiretapping from news reports referencing intercepted communications, despite the fact that he and his advisers have publicly denounced stories about government agencies reviewing contacts between Trump associates and Russians. In the two weeks since the tweets, the White House has tried to soften the statement, but not disavowed it. Spicer on Thursday asserted that Trump meant to broadly refer to "surveillance," rather than a phone wiretap. "The president's already been very clear that he didn't mean specifically wiretapping," he said. In an attempt to bolster his case, the spokesman spent nearly 10 minutes angrily reading from news reports which he said pointed to possible evidence of surveillance. The list included a report from The New York Times, which Trump has dubbed "fake news," as well as conservative commentary, a little-known blog and several reports based on anonymous sources, which Trump has said cannot be believed. It was not immediately clear what prompted the senators' statements Thursday. Burr and Warner were among eight senior congressional leaders briefed by Comey on March 10. A Senate aide, who requested anonymity to discuss the senators' private briefings, said Spicer was incorrect in claiming Burr and Warner had not been briefed on the matter. "Based on the information available to us, we see no indications that Trump Tower was the subject of surveillance by any element of the United States government either before or after Election Day 2016," Burr and Warner said in a one-sentence joint statement Thursday afternoon. The phrasing of the statement left open the possibility that tenants or employees working in the tower may have been monitored. In response to Trump's claims and a request from the House intelligence committee, the Justice Department is doing its own review of whether Trump or any of his associates were the subject of surveillance. The department is slated to provide a response to the committee by Monday. Burr and Warner are leading one of three congressional investigations into Russia's interference in the 2016 election, including whether Trump associates were in contact with the Kremlin. The senators joined a growing, bipartisan group of lawmakers who have publicly disputed Trump's accusation in the lead up to Comey's testimony. "We've cleared that up," Ryan said, adding that he'd received a briefing and seen no evidence of Trump's wiretap claims. But the issue is unlikely to pass as quickly as some Republicans hope. Sen. Lindsey Graham, R-S.C., said Thursday that he still believes the FBI or Justice Department should comment publicly in "a simple statement that goes to the heart of the matter — without jeopardizing classified information." "I believe such a statement would serve the public well, and I fear that without an official answer this issue will continue to linger," Graham said in a statement. On Wednesday, Attorney General Jeff Sessions said he had not given Trump any reason to believe he was wiretapped by Obama. Republican Rep. Devin Nunes, chairman of the House intelligence committee, said he had seen no information to support the claim and then went further. He suggested the U.S. president's assertion should not be taken at face value.